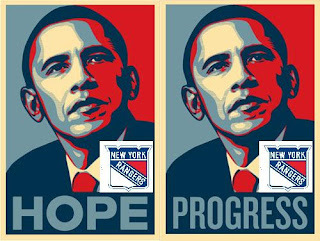 Though the New York Rangers lost to The NY Islanders last night 2-1 (and it is unforgiving), the rest of the world welcomed a new President -- so putting aside Rozsival and his blunders for a day, we can all start over and HOPE for PROGRESS in our country, our world and, secondarily, in our team. The Dark Ranger wishes best of luck to our President elect and even more specific hockey luck to our coach Tom Renney. No more political commercials. On to hockey.